Lorraine Paton: A Sunshine Award! 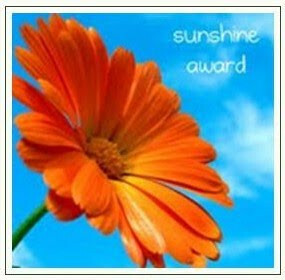 My lovely friend, Mae Clair, nominated me for the Sunshine Award! This is a fun award that bloggers give to other bloggers "who positively and creatively inspire others in the blogosphere." So, thank you, Mae, for including me! What an honour! Mae Clair wrote a great time travel werewolf romance called Weathering Rock. Now, I'm eagerly awaiting the release of her next book, Twelfth Sun, which is coming out in August. She has also has a regular blog post "Mythical Monday," where I always learn something new! Thank the person who gave you the award in your blog post - Thank you, Mae! Favorite Color: I like primary colors... so I guess I'll choose three! Blue and red for clothing and yellow for my walls! Favorite Animal: Cats. I live with two. That said, I would also like a dog, but so far that idea keeps getting nixed by my "other half." Favorite Non-Alcoholic Drink: Club Soda with Lime. Facebook or Twitter: Facebook for mostly close friends and family interactions, and Twitter for fun and learning. Giving or Getting Presents: Giving! Absolutely. I love trying to find something the person will enjoy. And, I hate surprises, which might explain why I also like to read the ends of books before I finish them. That is the only thing that bugs me about eReaders - how difficult it is to read the end before you get to it. Favorite Flower: The flowers on the Mayday tree, which is a type of cherry tree. It is the first happy sign of spring for me. Thank you for the sunshine on your blogs! Thanks for the lovely words about my blog and books, Lorraine.That was so very sweet of you! I loved seeing your Sunshine Award today. I am a "cat person" too but also love dogs. When I read print books, I used to read the closing lines of the book first. You're right, it's definitely harder on an eReader! Fortunately, I broke myself of the habit when I started reading mysteries (even in print). Hope you had fun with the Sunshine Award! Thanks for the award! I'm feeling all sunny now! Thanks Lorraine!! Happy Sunshine indeed!! Alberta: My Mayday Trees are blooming! A book cover!! I have a book cover!! Yay!! Alberta - Did you know Alberta has ferries? !